DASH (Desktop and mobile Architecture for System Hardware) is a client management standard released by the DMTF (Distributed Management Task Force). DASH is a web services based standard for secure out-of-band and remote management of desktops and mobile systems. Client systems that support out-of-band management help IT administrators perform tasks independent of the power state of the machine or the state of the operating system. Examples of out-of-band management tasks include: 1) Securely starting up a system remotely, even if it is currently powered off; 2) Viewing asset inventory information for a system that is powered off; 3) Retrieving health information about system components even if the OS is unavailable. For IT administrators who use Microsoft System Center Configuration Manager (SCCM) 2016/2012/2012 R2 / 1511/1602 /1606/1610/1702/1706/1710/1806, AMD has released AMPS 4.2 (AMD Management Plugin for SCCM) that supports DASH 1.2 profiles with KVM feature( refer release notes for detailed feature list ). AMPS 4.2 extends Configuration Manager2016/ 2012/2012 R2/1511/1602/1606/1610/1702/1706/1710/1806 to support out-of-band management tasks using DASH. AMC is a GUI based application for SMB (small & medium business) environments, capable of monitoring and managing up-to 500 DMTF’s DASH compliant client computer systems. This build supports KVM redirection for graphics based BIOS setup screen. The DASH CLI v2.1 is a command line application that is used to perform out of band management tasks (power management, asset inventory, alerts, etc.) using DMTF DASH specifications (supports 2.33 DMTF schema) against a DASH target. DASH CLI provides scripting interface and runs as a shell; This build supports KVM redirection for graphics based BIOS setup screen. ARCHIVED VERSIONS - The files below are no longer supported but are available without warranty for your convenience. For IT administrators who use Microsoft System Center Configuration Manager (SCCM) 2012/2012 R2 / 1511/1602 /1606, AMD has released AMPS 4.1 (AMD Management Plugin for SCCM) that supports DASH 1.2 profiles with KVM feature( refer release notes for detailed feature list ). AMPS 4.1 extends Configuration Manager 2012/2012 R2/1511/1602/1606 to support out-of-band management tasks using DASH. For IT administrators who use Microsoft System Center Configuration Manager (SCCM) 2012/2012 R2 / 1511/1602 /1606, AMD has released AMPS 4.0 (AMD Management Plugin for SCCM) that supports DASH 1.2 profiles with KVM feature( refer release notes for detailed feature list ). AMPS 4.0 extends Configuration Manager 2012/2012 R2/1511/1602/1606 to support out-of-band management tasks using DASH. For IT administrators who use Microsoft System Center Configuration Manager (SCCM) 2012/2012 R2 / 1511/1602 /1606, AMD has released AMPS 3.5 (AMD Management Plugin for SCCM) that supports DASH 1.2 features. AMPS 3.6 extends Configuration Manager 2012/2012 R2/1511/1602/1606 to support out-of-band management tasks using DASH. For IT administrators who use Microsoft System Center Configuration Manager (SCCM) 2012/2012 R2 / 1511/1602 /1606, AMD has released AMPS 3.5 (AMD Management Plugin for SCCM) that supports DASH 1.2 features. AMPS 3.5 extends Configuration Manager 2012/2012 R2/1511/1602/1606 to support out-of-band management tasks using DASH. For IT administrators who use Microsoft System Center Configuration Manager (SCCM) 2012/2012 R2, AMD has released AMPS 3.0 (AMD Management Plugin for SCCM). This release supports DMTF’s DASH 1.2 features. AMPS 3.0 extends Configuration Manager 2012/2012 R2 to support out-of-band management tasks using DASH. 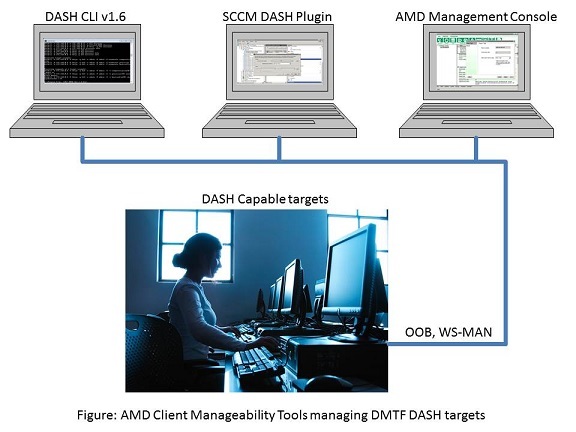 For IT administrators who use Microsoft System Center Configuration Manager (SCCM) 2012/2012 R2, AMD has released AMPS 2.5 (AMD Management Plugin for SCCM) that supports DASH 1.1 features. AMPS 2.5 extends Configuration Manager 2012/2012 R2 to support out-of-band management tasks using DASH. For IT administrators who use Microsoft System Center Configuration Manager (SCCM) 2007, AMD has released a DASH Plug-in for SCCM 2007 that has DASH 1.1 features. The plug-in extends SCCM 2007 to support out-of-band management tasks using DASH.